Rock climbing might not be the first thing that comes to mind when you mention Catalonia, or Barcelona. But apart from sandy beaches, tapas and great nights out, there are plenty of excellent rock climbing options near Barcelona that you don’t want to miss. Sierra del Monstec is one of them. Sierra del Montsec is home of the highest rock climbing walls in Catalonia. The beautiful Montesec range offers fantastic limestone rock and multi-pitch routes for different skill levels. With an impressive extension of 40 km, Sierra del Montsec is located in Lerida, Northeast Catalonia. “I love this location and I have a deep appreciation for it – and I love to share this with my clients”. Why Should you Go Rock Climbing in Sierra del Montsec? So why is rock climbing particularly great at Sierra del Montsec? Here are the top 3 reasons why. For starters, Sierra del Montsec is only 2 hours away from the city of Barcelona, one of the coolest cities in Europe. It only takes around 2 hours to drive there from city centre. The weather in Sierras del Montsec is great! Marc highlight the very special benefit of the possibility of climbing during the year’s coldest months, thanks to its location: most of the walls are facing south. Also, as Marc points out, the altitude here is between 1,000 and 1,600 meters. This adds to the fact that you can go climbing during most of the year, with exception of the hottest months. Sierra del Montsec offers a wide range of climbing options. 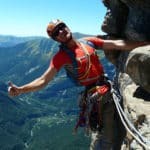 From via ferrata options of different lengths, to sports and trad climbing on walls between 30 and 600 meters high, with options for every skill level. Marc also adds that you will also find very high-quality sports climbing options, both for beginners and experienced climbers. “Everyone can find the right rock climbing option for them here!”. What do Marc’s clients value the most of their climbing experience in Sierra del Montsec? The feedback is straightforward: high quality rock, in a wild and beautiful context. Plus, Sierra del Montsec is quieter than other popular climbing areas in the region like Montserrat, Siurana and Margalef. What Type of Rock Climbing Can you Find There? Sierra de Montsec has climbing routes suitable for every skill and experience level. 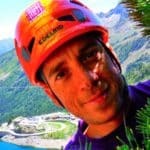 Certified guides like Marc can help you choose the best routes to accommodate your goals and skills. The area provides fantastic routes for sport climbing, trad climbing and via ferrata. If via ferrata is your thing, in Sierra del Montsec you will find many, many options in different areas. Including what is considered the most difficult via ferrata in Spain. Also, kids are welcome too! There is a special via ferrata great for young rock climbers out there. What Level Do you Need to Go Rock Climbing Here? All levels are welcome! The variety within the Montsec range offers plenty of options for all skill and experience levels. If you are a just giving your first steps in rock climbing, or thinking about starting, this is Marc’s advice for you: “For those who already know that they want to learn rock climbing, I always recommend a 2-day training course to learn the basic concepts and skills. A 1-day taster, to learn the very basics, is also an option if you want to explore”. If you already have some experience rock climbing, you may want to go multi-pitch climbing around Catalonia for a few days or even, learn the basics of trad-climbing on a 2-day course. There are three main large rock climbing areas in Sierra del Montsec. Here you will find walls of up to 200 meters. Rock climbing here is generally vertical climbing, with little approximation. Marc’s pro tip: Perfect area for beginners! Both in via ferrata and sports climbing. The highlight of this area is its 500 meters high walls. Great for those looking for their next rock climbing challenge. Beginners out there: there are also several walls for those just starting to develop their rock climbing skills. Marc’s pro tip: Amazing area for high quality sports climbing. Here, it’s all about the adventure! Get ready to discover exciting itineraries with little fixed holds. One of the wildest areas in Sierra del Montesec. Simply spectacular. Marc’s pro tip: Montrebei offers some of the climbing options closest to Barcelona. For more information on each of these areas, check out Marc’s Multi-pitch climbing in the Montsec Range, Catalonia. Programs start at 140 EUR per person per day! Sierra del Montsec is particularly blessed with great weather conditions due to its special location. It is generally recommended to avoid the hottest months. The best time to visit is during the Spring and Autumn. We’ve already mentioned how close Sierra del Montsec is to Barcelona. There are plenty of options to make your way here. The fastest is to get here by car, which also allows you to move around more easily to cover as much area as you can. Depending on the exact location, you will need to drive between 1 and 2 and half hours from the centre of Barcelona. Something to consider as well is that Sierra del Montsec is located less than an hour from other great spots like Montroig, Alt Urgell and Collegats. All set? Get ready to visit Sierra del Montsec for a superb rock climbing experience. And if you’d like to discover more rock climbing spots in Catalonia, check out our guide of the best places to go rock climbing near Barcelona. Thank you Marc Vilaplana for sharing your experience and pro tips with us!